Home > About > Why Choose SCARS Center? If you have been recently diagnosed with skin cancer, you may have a long journey ahead of you. SCARS Center offers a diverse team of physicians, specializing in every field of skin cancer management, the greatest range of surgical and non surgical skin cancer treatment options, and the best plastic and reconstructive surgeons in Orange County. You deserve the best outcome possible. Let Skin Cancer and Reconstructive Surgery Center offer you an in-depth team approach to skin cancer cure. SCARS Center specialists include Mohs Dermatologists, Radiation Oncologists, Dermatopathologists, Facial Plastic and Reconstructive Surgeons, and Ophthalmic Plastic and Reconstructive Surgeons. The members of our team are some of the most widely used physicians for difficult skin cancer cases in Orange County. Each board certified team member plays an integral role in the patient treatment planning process, working together to ensure cure and reconstruction are achieved with complete success and the best possible cosmetic outcome. Additionally, each member of the team is a committed lifetime learner, spending several hours a month focused on continuing medical education and skin cancer research. This enables our physicians to remain on the cutting edge of skin cancer treatment and technology, promising the most up to date and reliable treatment options possible. SCARS Center treatment options range from non surgical treatment courses, such as topical and oral chemotherapy, Photodynamic Therapy (PDT), and Superficial Radiotherapy (SRT), to surgical excision with Mohs surgery and skin cancer reconstruction. We are the only treatment center in Southern California with this variety of specialized skin cancer treatment options. After reviewing your case, our specialists will determine which treatment course is best for you. All SCARS Center treatments are completed on site at our Newport Beach facility. Providing multiple treatment options simplifies the patient experience by allowing them to remain in one, comfortable and friendly environment throughout treatment and during surgical removal and closure. SCARS Center surgeons' primary goal is to Achieve Cure while Maintain Functionality of the face and body, and Preserving the Appearance of our patients. Every treatment course is carefully reviewed by both a Mohs dertmatologist and a reconstructive surgeon, to ensure the skin heals and is restored to its most healthy and natural state. SCARS Center is home to some of the most widely used plastic and reconstructive surgeons in Orange County, garnering hundreds of patients a year from other dermatologists and primary care offices in the south western region of the United States. Our reconstructive surgeons are board and double board certified, with anywhere from 5 years to two decades of experience. 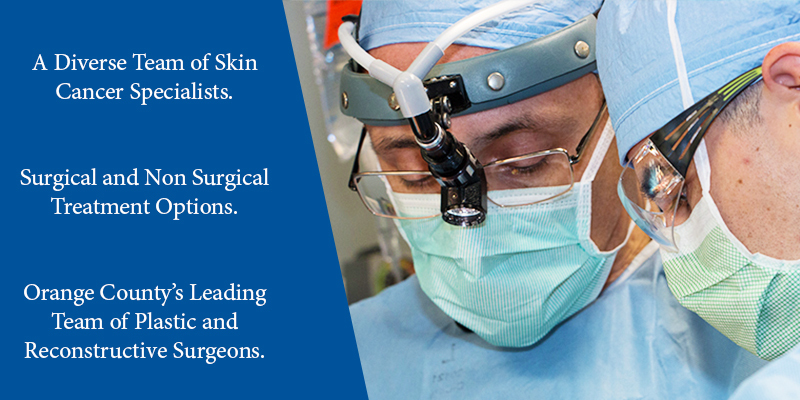 Choosing a surgeon whose focus is primarily on the face and eyes provides patients with a level of expertise in technique and anatomical structure that is unparalleled by general surgeons, primary care physicians, or dermatologists. If a patient is diagnosed with skin cancer on the face, ears, eyes, or mouth, it is imperative to find a credible and experienced reconstructive surgeon. At SCARS Center, our surgeons work with existing SCARS Center dermatologists in addition to outside referring dermatologists. Our aim is to provide every skin cancer patient with a desirable outcome after skin cancer cure. If you would like to learn more about how you can receive treatment at SCARS Center, contact us today. If you would like to learn more about how you can receive treatment at SCARS Center, contact us today!